It was another day of driving to various places today, venturing from Plymouth west into Cornwall. We decided we didn't want to spend time going too far west since we need to head east again soon to fit in places later in our journey. So we found some spots in the Lonely Planet worth visiting on the coast not too far from Plymouth. But first we packed our bags and headed down for breakfast. The cereal choice was limited to honey-nut corn flakes, wheat chex, and Weet-a-Bix. We both chose the latter and ate them while the same lady who had checked us in last night cooked up eggs for us and mushrooms and grilled tomatoes for me. I also grabbed a fresh banana from the fruit bowl. After checking out, we packed the car and went for a walk over to the Hoe to see the views from the park over the harbour and out to sea. The weather today had turned cold and windy, and we both needed jumpers and jackets to keep warm under the cloudy grey sky. The view however was very good; it was easy to see why the English wanted to build a seaside holiday resort here. As we watched the uninviting cold ocean and the seaside walls, boat moorings, and ice cream stalls, we saw a group of men emerge up a set of stone steps, jog around on the road for a bit, go down another set of steps to the water and some rocks below, and plunge straight in! 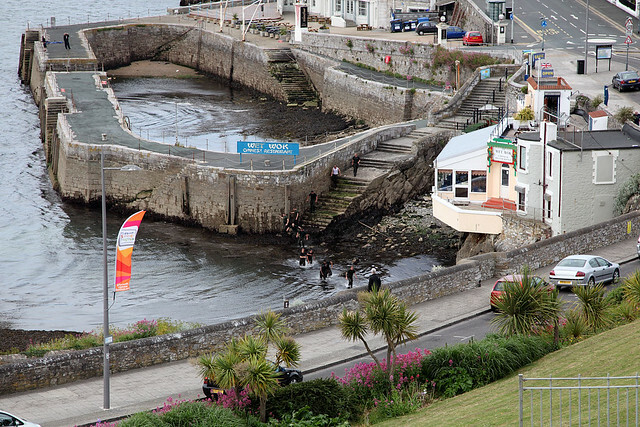 They waded through the water to the base of the steps where we'd first seen them running up. As we watched in amazement, they began another lap. We figured they must have been army personnel from the nearby base in the walled fortress near the Barbican district. Some training run! 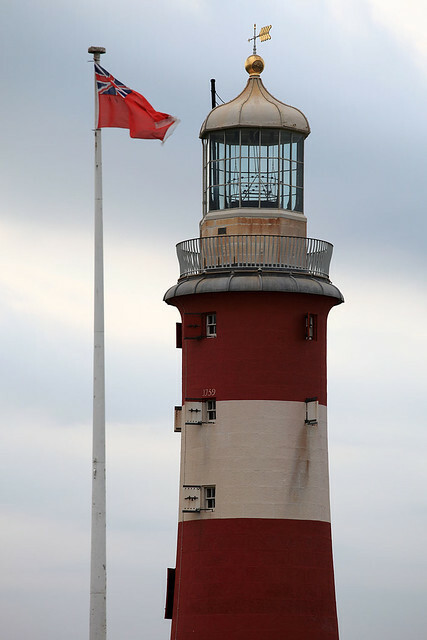 The Hoe contained a monument to Francis Drake, who also left from Plymouth on his famous round-the-world journey of discovery in 1577, and a view of a nearby lighthouse, striped in horizontal bands of red and white. We didn't spend too long here though, both because of the cold wind and because the car was in a spot where it would be fined after 10:00. So we walked back and drove off just before that happened. 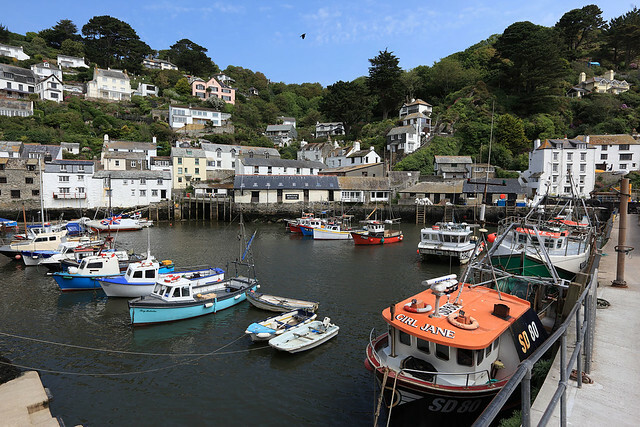 The first destination was the small fishing village of Looe, on the south Cornwall coast. This turned out to be larger than expected and fitted out with a vast array of shops and food places aimed squarely at tourists. The town nestled in a steep-sided river valley at the mouth of the river, looking out on to a beach. The valley walls were filled with colourful houses leading down to the river, full of colourful boats. The tide was out and many boats were left high and dry as the river had shrunk to a narrow stream in a deep channel to one side. We parked in a massive car park on the edge of town, paying just 10p for an hour. The alternative was £1.50 for two hours, so M. decided to settle for one hour. But we'd seriously underestimated the size of the place and had to rush to see it all. The row of shops and stream of tourists led down to the beach front, where some hardy English families were defiantly sitting on the sand and some even splashing in the freezing looking water despite the strong, cold wind. 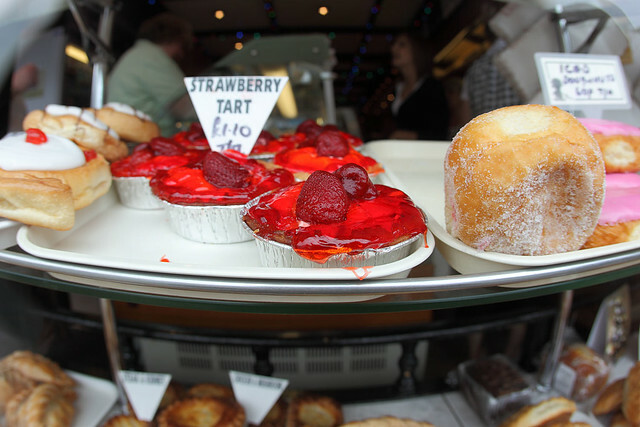 Being Cornwall, there were dozens of bakeries selling hot pasties and cream teas. We stopped in one to get a beef and Stilton pasty for me and a chick pea and lentil one for M. They were huge and comprised a complete early lunch. They were both full of potatoes mixed with the advertised filling. 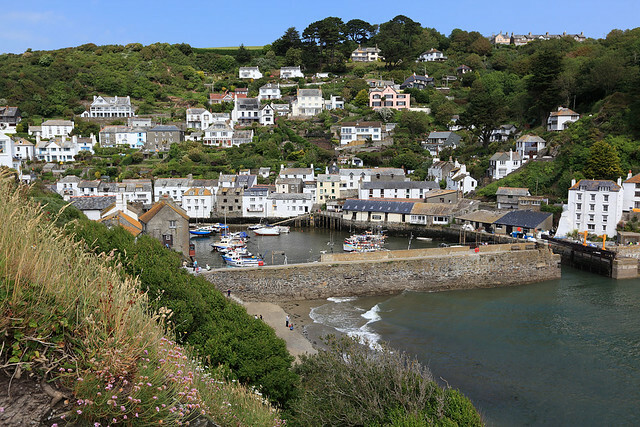 Heading out of Looe, the next stop was the nearby village of Polperro, described by the Lonely Planet as even prettier than Looe. We decided to pay for at least two hours parking there to allow a better look around. As it turned out, two hours was the minimum time you could buy in a car park that contained very tightly spaced rows of narrow spaces. It took several reversals to manoeuvre the car into a tight spot between two others with barely enough room for anyone to open doors. And as soon as we'd parked, the people in the adjacent car turned up, climbed in, and left! The walk into town was down a narrow lane which was closed to all but local traffic, so there were few cars, but there was a shuttle minibus decked out as a tram and a couple of clip-clopping Clydesdale-drawn wagons to carry around tourists too lazy or infirm to walk. 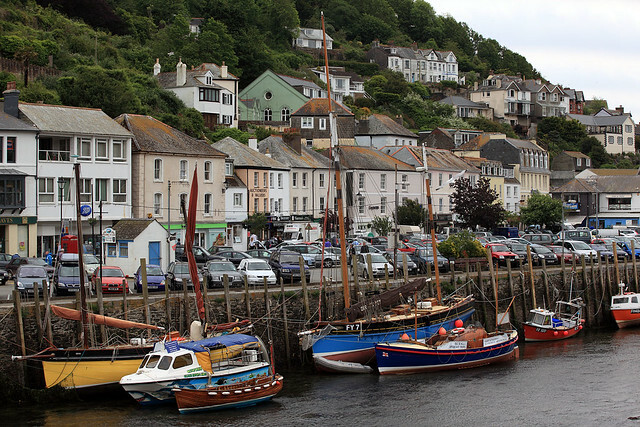 There were similar shops to Looe, but as we discovered significantly fewer, and the village was quite a bit smaller. It was beautifully scenic though, as the mill stream that still turned a working water wheel at the top end of town ran down along the lane, trickling pleasantly until it reached the small harbour, again full of boats, but largely empty of water at the low tide. The harbour here was walled off from a steep cleft in the rocky cliffs where the ocean cut into the stream. There was no beach in sight and climbing a path up the western cliff gave a panoramic view along the rugged coast and up the valley over the town. We took our time to take it all in and then began the long walk back up to the car. M. got a coffee and tried some genuine Cornish ice cream (always try the ice cream in dairy farming country!) - peach and strawberry flavours. It was creamy and delicious. We also bought some fudge in various coffee and chocolate flavours for M.'s sister, and some organically produced local wool for her mum to knit with. 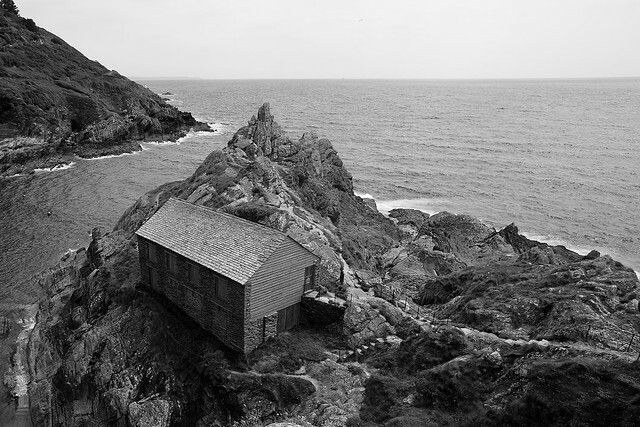 From Polperro, we headed north to cut across Cornwall and begin our return to the east. 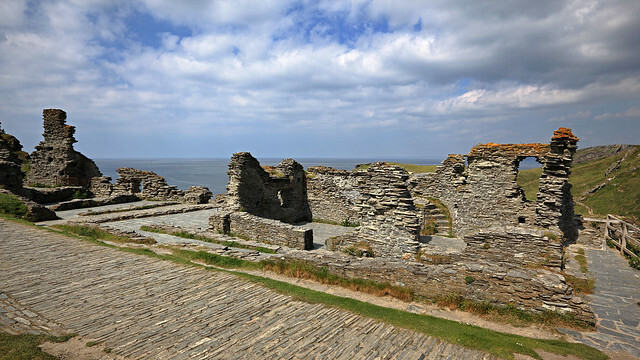 The target was the town of Tintagel on the north coast - the legendary birthplace of King Arthur and site of a very real ruined castle perched precariously on a bluff overlooking the sea and a dramatic coastline. The drive north through central Cornwall was fairly eventless, and we navigated the roads easily this time. We pulled over at one point to eat the apples we'd bought back in Salisbury. A few times we were tailed by old people with grey hair, driving like they were impatient to get past us. One old couple did this on a motorcycle. Apparently in England retirees hit the roads and terrorise other drivers. 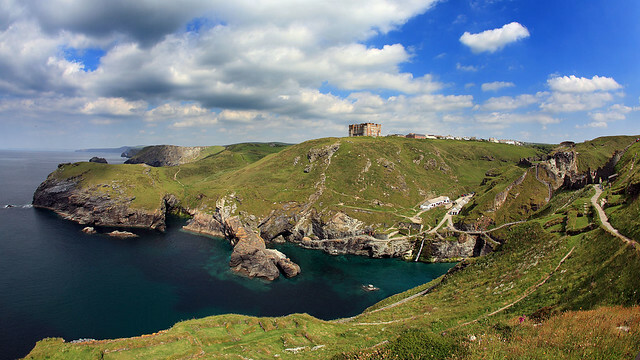 Tintagel appeared, the village overrun with touristy shops, all named after various things from Arthurian legend. We pulled into a car park operated by the King Arthur's Arms pub and paid £2 for four hours parking. We walked down towards the castle, passing various shops touting knightly and magical wares, one with life-sized fibreglass statues of Arthur and Merlin out the front. Past the tacky shops was a steep gravel path leading down a narrow cleft to the ocean. Up on a bluff to the left was a ruined set of walls which we took at first to be the castle. But emerging from the valley near the water, we saw another steep, rocky hill extending out into the ocean, topped by much more extensive and impressive ruins. The ruins date from the 13th century - several hundred years too late for Arthur. Although the walls are not complete, the remaining structure is in reasonably good condition and the layout of the castle is evident in the may rooms whose foundations can be clearly seen. The whole site is carpeted in plants, currently in flower, and various birds were flitting around, making it a very pretty site. And the view from up on the rock is spectacular. Even if not chosen for difficulty of access and ease of defence, you'd pick this site to build your castle anyway, just for the view! It was hard and hot work climbing the various steep trails and steps to cover the site. The weather had cleared up and the sun was now burning down out of a partly cloudy sky. Taking the newly installed wooden steps and bridge back to the path to the village we were forced to wonder how the original builders even managed to access this impossibly rugged and steep outpost, let along build a castle on top. 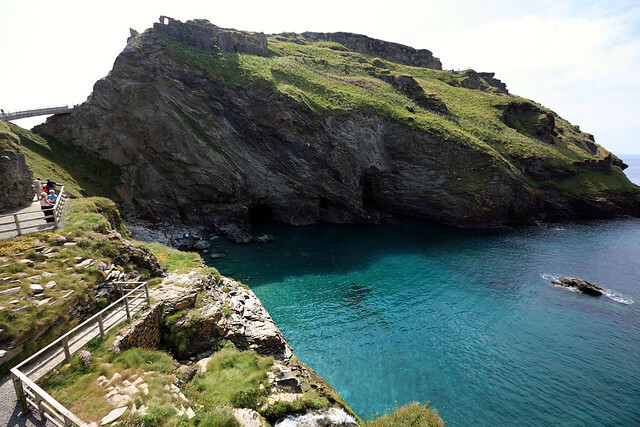 By the time we had walked back up to the village, it was almost 17:00 and we decided to seek accommodation for the night in Tintagel rather than drive any further. We asked at one pub, but they only had a room with single beds, so we crossed the street to the King Arthur's Arms, adjacent to where we'd parked the car. They had a room free, for £75, so we took it. Conveniently, we didn't even need to move the car, as they recorded that we were guests and could stay in their car park. We settled into our room, then went for a walk through the village that we'd neglected on our way to the castle earlier. Half the shops had closed for the day, but a few were open and we browsed briefly. 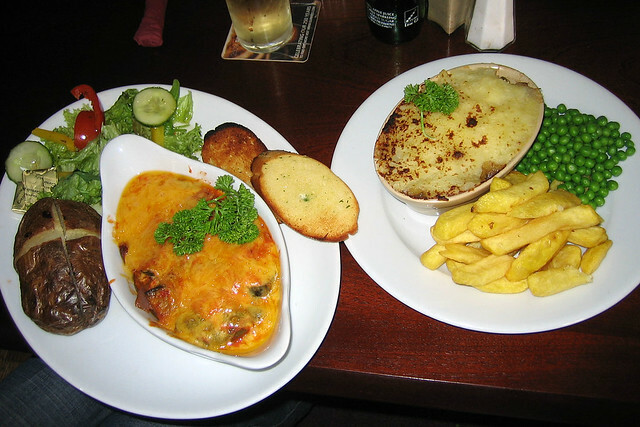 Then we returned to our pub for dinner - M. had spotted veg lasagne on the menu earlier. She ordered that and I got the cottage pie and a pint of Cornish pear cider. The food and drink were both delicious. I was tempted by an apple crumble with clotted cream for dessert, but I was too full to go through with it. We returned to our room to get an early night. The pub's free Wi-Fi worked from in our room, so we sent some e-mails and then showered and turned in for the night. Last updated: Friday, 18 January, 2019; 15:56:16 PST.